Financial capital is bankable, fungible, and valuable but often at risk. The more we live in a world of monetized values the more fragile and vulnerable we seem. With bad management it can evaporate before our eyes, leaving us bankrupt. Family capital can claim an advantage here as an intangible and generally less soluble form. It can be defined as the added value to a business that family ownership and participation brings. The dividends that emanate from this capital are various: most obviously in the durability and trust that stakeholders – customers, employees, suppliers and investors – derive from knowing that they are engaging with the people who own the name above the door. Just as intangible yet priceless is the sense that the business is not driven by short term considerations: quarterly results, analysts’ detached judgements or the whims of diverse shareholders. Rather it is driven by the purpose, values and long term perspective of a family who see the business not as bundle of assets but as an organic human community, and a legacy for future generations; not just for the owners but the generations of families and professionals who work alongside and with the business. There is also the considerable benefit that the family as controlling owners can make swift and pragmatic decisions in a way that many public companies find impossible, such as to switch a line of business, make a big investment, divest an operation or move into a new market. We can even put a monetary value on the intangibility of family capital. Studies from around the world have shown how family firms outperform non-family businesses when compared head to head, and it has been observed by many commentators how family firms, with their deep relationships and long horizons, were able to weather the storm of the recent financial crisis better than other types of business. Yet family firms also bear a special burden of uniquely challenging risks. The dark side of family capital is that it can destroy itself through implosion, due to the nuclear fission of conflicting personalities and emotions. The special strength of family capital comes from the binding forces of love and commitment providing a protective shield that allows creative and constructive conflict to flourish without threatening unity in a way that is impossible in non-family firms. Truths can be told and listened to. But if the sources of conflict are driven by the great destructive forces of envy, rivalry, antipathy and resentment, they can overspill and overwhelm the parties and sweep away in an emotional tsunami the shared commitment that is the central motif of family capital. 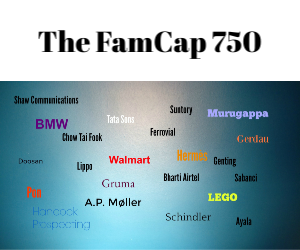 So how is family capital to be nurtured and grown? The answer is the supervening sense that family members own family capital – “emotional ownership”. Even if you don’t have shares in the business, you can still feed on the power of identification and involvement in it. The reverse is also possible – people who own shares but have zero emotional ownership. Building and maintaining emotional ownership requires good governance, effective communication, and culture building activities that get everyone in the family to see that they, in a climate of inclusion embracing the non-family executives who help them run the company, have a share in its destiny and in the good that it creates within and beyond its boundaries. Nigel Nicholson is Professor of Organisational Behaviour at London Business School, author of The ‘I’ of Leadership: Strategies for seeing, being and doing and co-author of Family Wars. He has also written articles on emotional ownership with Ẩsa Björnberg.